Arizona is no stranger to strong monsoons in the spring and summer months, but few Arizonans were prepared for what was coming their way on Monday, July 9th, 2018. 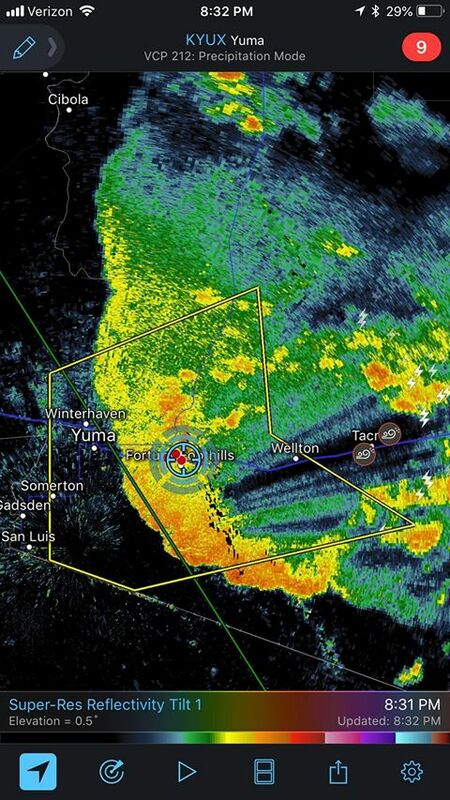 After 118-days without rain in Phoenix, Monday’s monsoon brought 70mph winds, torrential rainfall, hail, flooding and most ominous, a massive haboob. So, we know what you are asking. 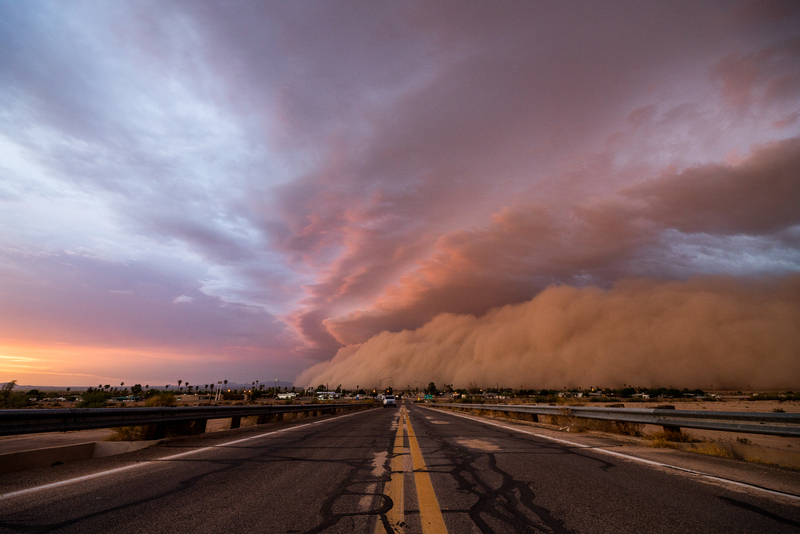 What exactly is a haboob? Essentially, in 1971, a group of local scientists in Arizona witnessed a dust storm so massive that they compared it to the giant dust storms that frequently overrun Sudan’s capital, Khartoum, which is called ‘haboob’ in Arabic. Reaching upwards of 8,000 feet high, the wall of dust will have heavy wind speeds, a rise in humidity and a sudden drop in air temperature. So when Phoenix based storm chaser and photographer Mike Olbinski woke up on July 9th in Blyth, California, he knew he had to rush home based off the weather models he checked first thing in the morning. Olbinkski detailed the chase on his Facebook post. I kinda had the entire day mapped out before breakfast based on models and how this same deal happened on July 29th, 2016…and sure enough it played out the same way. Except BETTER. Because this time the storms were early. And we had 150 miles and hours to stay in front of a churning, dense haboob. 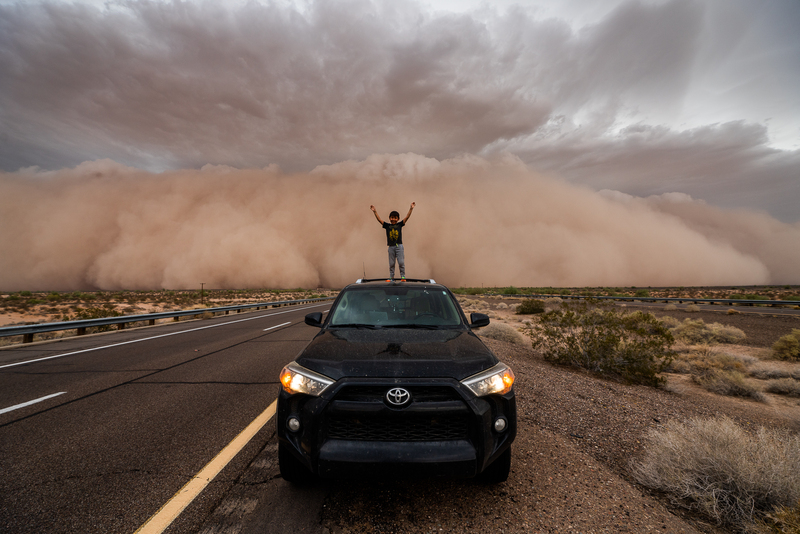 From driving through it near Stanfield, to a gorgeous haboob approaching Vekol Road, then it was to Gila Bend and after that is when it really came to life and was a dream to chase all the way to Yuma. Better yet was the fact that this wall of dust was so thick, NO traffic came from the east for at least an hour. All it was was about 5-7 storm chasers leapfrogging each other, jumping out along Interstate 8, hootin’, hollering and high-fiving. It’s no secret that we are big fans of Olbinski’s storm chasing photos and time-lapse films. In fact, we have brought you along for the ride in 12 of his previous storm chasing experiences, and all are as beautiful and fascinating as the ones before. So when I saw this incredible moment on his Facebook post, I had to sit down with Olbinski and get the story. That is one big haboob! Is this the biggest one you have ever seen? No, it’s not the biggest, but I’m definitely ranking it #2 all-time now! The best will always be July 5th, 2011. 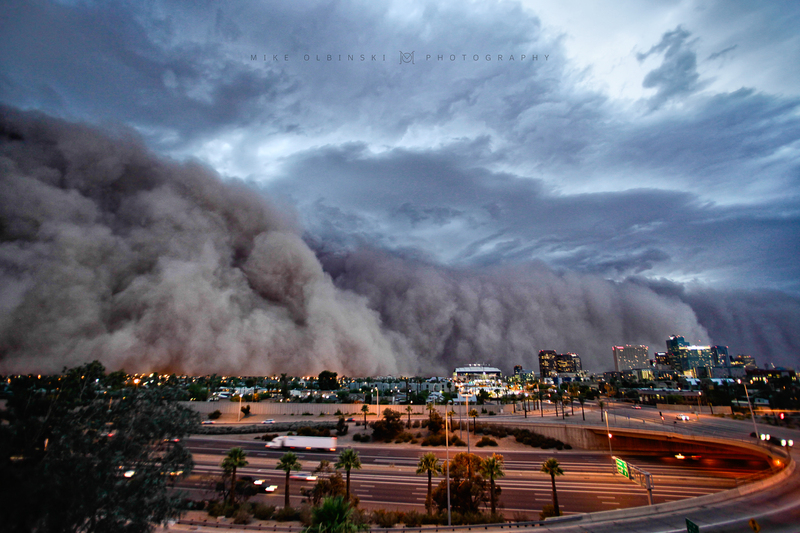 That was the first time-lapse I ever did of a haboob and it went viral within an hour of sharing it online. One that size won’t be seen out here again I don’t think, but this one from July 9th, 2018 was absolutely stunning. When the wall is quickly approaching, is there ever a fear of the unknown about being inside of one? No fear for me really. 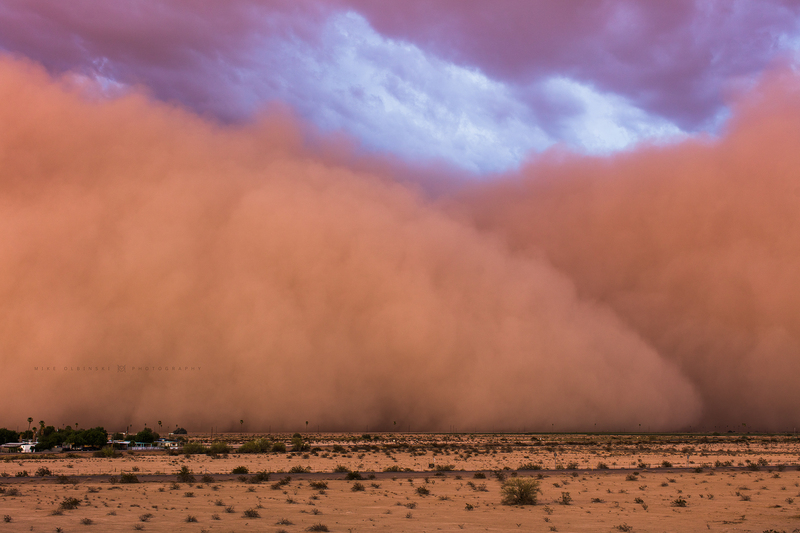 I’ve been in countless dust storms, and they vary in intensity and strength. However, we could definitely tell this was a dense one and if you got stuck inside for too long, it would be very hard to get back out with the low to zero visibility. For a time-lapse guy like me, I usually let it hit me, wait about 20 seconds, then race out of it as fast as possible. The good thing about this one is that it was so dense, we really had no cars to worry about on the interstate because they’d all pulled over behind it. Some of your footage looks to be taken from inside the haboob. After it would descend on you, what was the game plan? That footage was in Yuma and was basically when it was dark and we decided to call the chase. So we pulled into a lot and waited it out. The wind and sand was so intense. I think my windshield may have thousands of tiny little dings in it now from what I noticed today. Once it passed, we went back east towards home to hopefully catch some lightning, but it ended up just being rain and wind. How long were you chasing this one? The storms that really helped spawn on this hit around the Casa Grande area, as well as rolled through Phoenix around the same time. So I was on it from the start west of Casa Grande around 4:30pm. The last video was shot at 8:30pm when we gave up, so a solid four hours. It was a dream to catch it with all that time and daylight left. 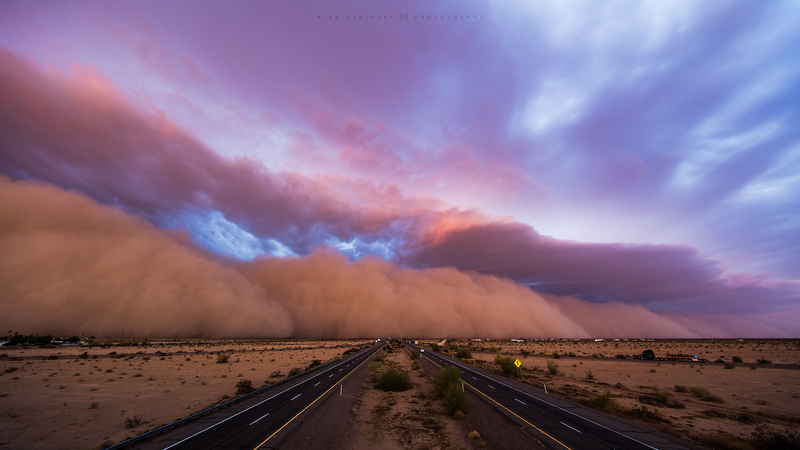 I’ve done two similar chases the past two years, both of them were AMAZING haboobs, however, they came after dark or right at sunset too early, and the chase west to Yuma was so dark that the photos were impossible to do much with. But July 9th…150 miles of chasing and tons of stops and fun photos along the way. Great times. Your friend Greg McCown has a photo of you and fellow chaser John Sirlin standing outside as the haboob seems mere meters away. Did he snap those pics and then you immediately ran for cover in the vehicle? I think the haboob was further away than it looked! Those are monsters, being nearly 3000-5000ft tall. So while it looked close (and it still in reality was), it wasn’t a “shoot and run” situation completely. However, I’m sure within the next five minutes of those pictures, we were packing up. Sometimes you get in front long enough to time-lapse for half an hour, sometimes a mere 5-10 minutes. Any advice for amateur storm photographers on how to safely photograph one? If you see one, and you’re new, definitely keep ahead of it. Don’t wait for it to hit you. And be very cautious if you are trying to punch one to get to the other side. You never know who might have stopped in the middle of the road because of low visibility and didn’t pull off to the side. What was it like to experience this incredible moment with your kids? 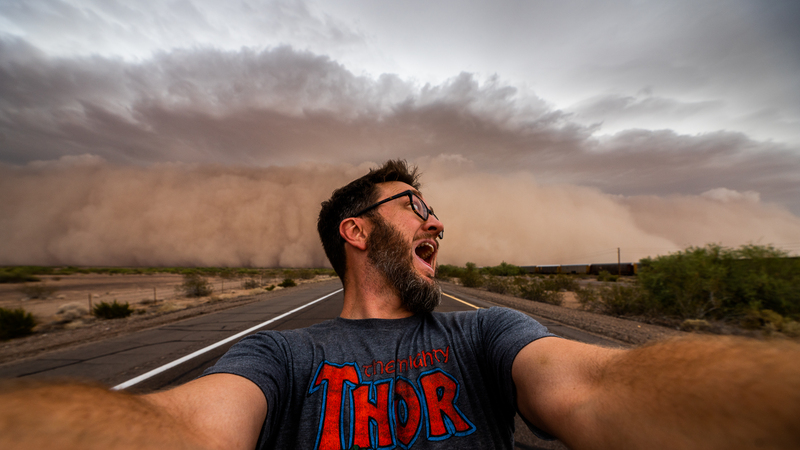 Well, my kids probably just love being with dad, on the road, getting snacks and being on their iPad…but we do have a ton of fun watching these storms, and while they don’t always understand it all, they definitely let out a few “wows” for this dust storm. And I got some cute shots of Eli on top of my truck, a selfie with them together and a dust storm behind us and my daughter was shooting BTS video all day which I loved. Hopefully someday in life they will look back with fond memories on all this, because for me it’s already amazing now. So there you have it. Another day, another incredible storm chase with Mike Olbinski. Look out for his upcoming completed time-lapse film of this entire storm on an upcoming feature on Resource Travel. See more from Olbinski on his website, Facebook, and Instagram.